LAKEVIEW — Step aside, Lane Tech. As Lake View High School graduates its first class to experience four years of STEM education, the neighborhood school is shedding its reputation as a back-up and bursting into the spotlight. 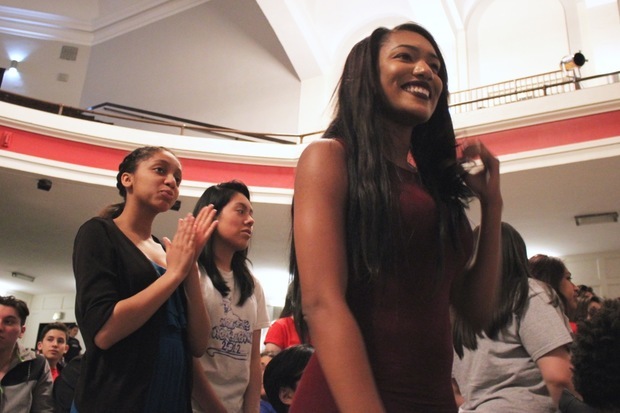 Out of 285 graduating seniors, 86 percent are heading to college — a 20 percent bump from 2013 and 2014 and above state and CPS averages, according to CPS data. Another 5 percent are joining the military, the school said. As one of five STEM Initiative Schools in CPS, Lake View students learn computer coding and build robots before they can even drive a car. "We've tried to build that culture here to show them we expect you to go to college if you come to Lake View," Principal Scott Grens said. "And if that isn't for you, we'll find a career that is the right fit." 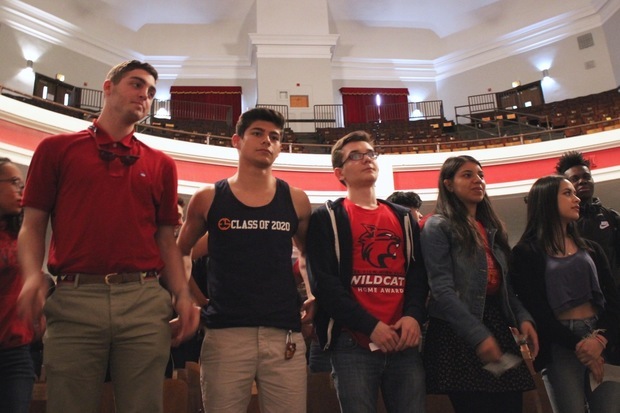 Seniors celebrated their successes and college plans during a Decision Day assembly last week. 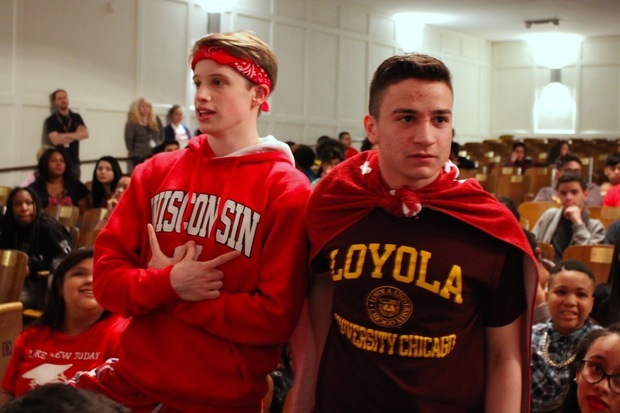 They also shared their hard-earned wisdom with incoming Lake View freshmen during a prep night a few days earlier titled, "Oh The Places You'll Go." The sentiment rings true for the high school as well as its students. In November, Lake View's school quality rating rose from the third highest of five ratings to the second highest, just as Ald. Tom Tunney (44th) announced a multimillion-dollar investment for the school. Graduation rates have increased from 82 percent to 89 percent over the last five years. Recent Lake View grads have been accepted to Cornell, Purdue and University of Illinois. They received a combined $12 million in scholarships so far this year — the largest total since the STEM program launched. Lake View, 4015 N. Ashland Ave., is expanding its partnerships with Microsoft, DePaul University and college readiness groups like College Possible and One Goal. The corporate partnerships help students such as Damian Medina land technology-based internships, getting paid experience as they test out potential careers. The impact, Grens said, is huge. "They seem to have almost a different set of convictions of what they're going to study and why, because they've already done it in high school," he said. "They've done it in an actual job market, and that's paying off in terms of exposure." It was Lake View's STEM program that steered Jack Luzadder to studying biomedical engineering at the University of Wisconsin this upcoming fall. Luzadder, 18, has built websites from scratch. During a robotics class, he helped program a robot to participate in a dance competition. "I fell in love with the teachers," Luzadder said. "The teachers have been amazing these last four years." Like Luzadder, fellow senior Owen Leon wasn't sold on Lake View back in eighth grade. From Bell Elementary School, Leon applied to selective enrollment schools like Lane Tech, leaving Lake View on the back burner "as a last resort." "I was a little pessimistic," admitted Leon, 18, who will attend University of Illinois at Urbana-Champaign in the fall. But between running track and delving into history classes, Leon found Lake View to be a far better fit than he thought. On Decision Day, Leon stood before his classmates as the graduate to receive the most in college scholarship money — a whopping $617,000 that largely came from winning a full-ride Evans Scholarship for golf caddies. Despite the specter of massive budget cuts next year, Grens said he believed Lake View would continue on its path to even greater success. "We've talked about this scenario with all our partners — we need more help than ever before," he said. "We're getting them in the building more, and it's paying off."